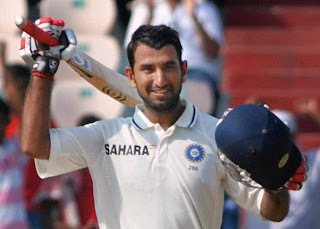 Home » Australia , Cheteshwar , india , ODI , pujara , SPO , World Cup » Why Cheteshwar Pujara should play One Day cricket for India? The selection of India’s One Day International team for home series against Pakistan creates more questions than giving any fruitful answers. In spite of performing extremely well against mighty English side during the test series, India’s latest batting sensation Cheteshwar Pujara could not find the place in One Day team. Cheteshwar Pujara has played 9 test matches scoring 761 runs at an impressive average of 58.53 with 3 centuries. He has also played 30 T20 matches and batted with a strike rate of 108.44 showing that he certainly knows how to score runs quickly. We must remember that India would be playing next World Cup in Australia where team would need few batsmen with sound technique and ability to play pace bowling effectively. On both these parameters, Pujara fits the bill. With form and fitness of “Sehwag”, Puajara might prove handy as opener so that rest of lineup could attack while Puajara holds one side firm. Puajra had certainly showed that he possess the ability to play for long time without losing wicket. If Indian team management are serious about their preparation for next World Cup and want to follow certain road map then you can’t cross many miles without taking player like Puajara on board!